My husband, Tim, suggested I try making my own version of the infamous and much hated convenience food, the Pot Noodle. He wanted to be able to take what he started referring to as a ‘Pot Ramen’ to work and just pour boiling water on before eating. This is the recipe I created for him. 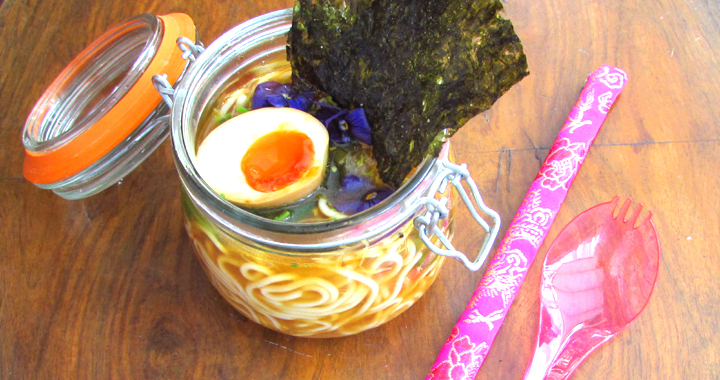 Tim has already taken his Pot Ramen on his commute to London and into work for lunch and has given it a big thumbs up. The best thing about this recipe is that it can so easily be thrown together the night before and takes very little effort, but what you have is a tasty, inexpensive and healthy lunch. And you can vary the toppings. I had a bag of mixed salad in the fridge and some radishes when I made Tim’s so threw those in, but you can use whatever you fancy. I made a ramen egg which I put into a separate lunch container for Tim to top his ramen, because in his words ‘the ramen egg is the best bit’, but you could easily use shredded chicken or more veggies. Put the noodles in the bottom of the jar. Sprinkle the stock powder, chilli bean paste, toasted sesame seeds and wakame over the top. Put the chilli, salad and beansprouts over the noodles and press lightly into the jar. Keep the Pot Ramen in the fridge until lunch. When you are ready to eat, squeeze the miso soup sachet over the top and pour boiling water three-quarters of the way up the jar. Stir well with chopsticks to break down the miso and chili bean paste. 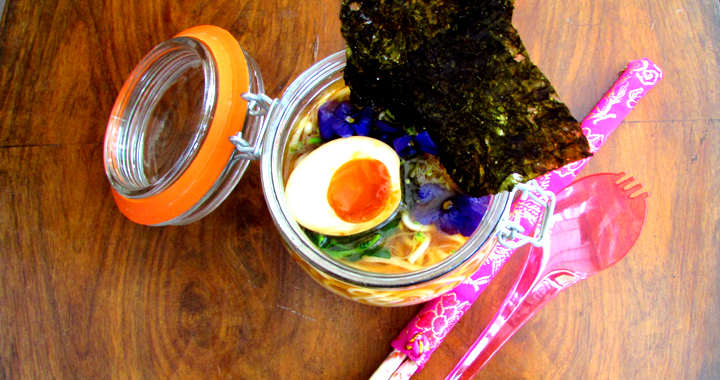 Top with the ramen egg and a few sheets of nori for the perfect lunch on the go pot ramen. Dip the sheets of nori into the broth- yum! 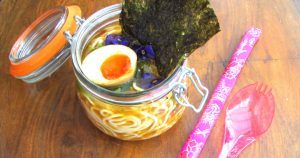 Posted in Main Dishes, Ramen Dishes, Recipes, Uncategorised and tagged Lunch, Miso, pot ramen, Ramen.